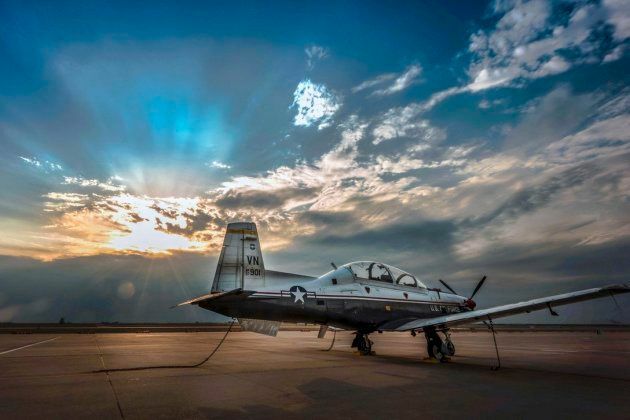 Thanks to our friends at FIGHTER SWEEP for this short (1:15) video (immediately under the static photo of the plane parked on the ramp) of the new USAF & Navy T-6A Texan II Jet-prop trainer at work plying the clouds. 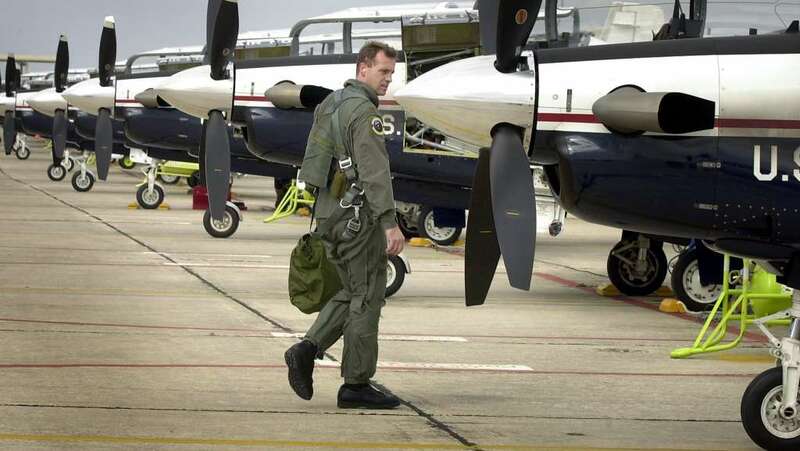 The Raytheon Aircraft-built Texan II is a single-turbo prop engined, two-seat primary trainer, used to teach basic flying skills to Air Force and Navy pilots. 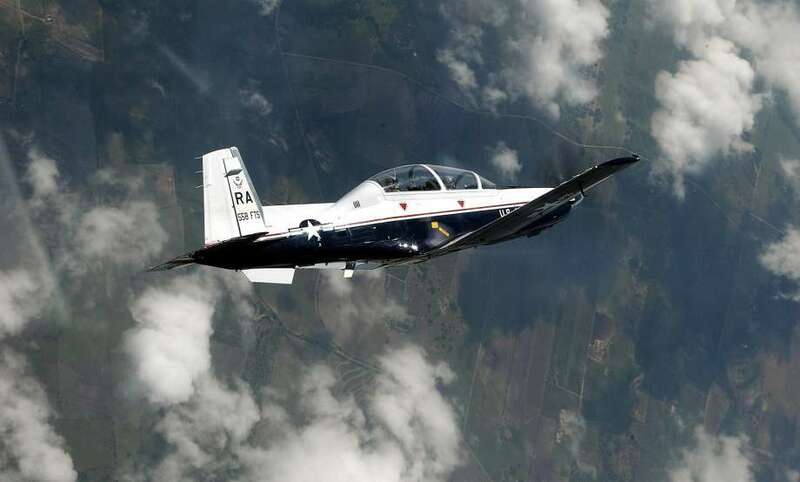 The aircraft is fully aerobatic and features a pressurized cockpit with an anti-G system, ejection seat and an advanced avionics package with sunlight-readable liquid crystal displays, or as they are more commonly known, a full “Glass Panel.” It is the military trainer version of Raytheon’s Beech/Pilatus PC-9 Mk II.This trainer was first featured on our site some four (4) years ago. One of its early test pilots was none other than our own FASF Advisor, Patty Wagstaff of Florida, Air Show and International Aerobatic competition fame. Texan II on Ramp at Vance AFB. And, immediately below, is another (4:15 long) video of the Texan II in action – Practicing formation and aerobatic work. The lead female pilot using the cockpit GoPro camcorder is Air Force pilot, Courtney McCallan. And, below, another T6-Texan II training clip, 3:10 in length. Below is another video, but this time of the original WWII – Korean Conflict Basic Air Force and Navy Trainer, the North American T6, which was designated the SNJ by the Navy. The Canadians and British called it the “Harvard.” The Basic Trainer was conventionally powered. This video is 5:26 in length. This is the airplane in which your Editor did his basic training in the USAF. Below is a 3:29 long video using another HD Go-Pro camcorder taking the cockpit view during airshow maneuvers in Germany. Notice the control stick is the British type with a small ring at the top of the stick. This is the kind of stick, called a “Spade Stick” found in both the Super-marine Spitfires and Hurricanes fighters that successfully fought the Germans during the Battle of Britain in WWII. Below is the 3rd phase of flight training at Vance AFB – the class’ final video summary of their year training to be USAF Pilots. The full video was class (student) produced. Show is 5:30 long. Gives a good insight to what lies in store for USAF Pilot students in their first year of Pilot Training. Includes typical student off hours recreation activities and finally the step up to flight training in the T-38 “Talon” aircraft. Time to fly! Row of Texans at the ready. This entry was posted in AVIATION NEWS, NEW VIDEOS and tagged Aerobatics, Airshow, Basic Trainer, Beechcraft, Courtney McCallen, Fighter Sweep, formation flying, Germany, Harvard, Navy, North American T6 Texan, Patty Wagstaff, Pininterst, Prop-Jet, Raytheon, SNJ, Spade Stick, T6 Texan, Vance AFB Oklahoma, WWII on May 12, 2018 by FASFRIC.